Every year when I meet with new coaching clients, parents complain that their kids don’t manage time well. I often ask: how do you model time management to your teen?! Parents can usually tell me what their personal method of managing their calendar is like. They often have a family system for consolidating appointments in one place, like a calendar that hangs in the kitchen. However, usually the parent is the one managing everything, and the teen is a passive recipient. Rarely can parents point to an established process for doing calendaring alongside their teen. Every year I suggest that families have a family calendering meeting once a week. Many families I work with tell me that it’s too difficult to get everyone together for this kind of a meeting. However, I contend that if you can’t prioritize time management for your whole family, how can you expect your child to do it for school? I honestly believe that, if families took me up on this suggestion, it will totally transform their ability to plan efficiently together…and simultaneously build a strong time management habit in their teen. Every week at the same time, ask everyone to bring their planner (or blackberry, iphone or laptop) to the meeting. The sole purpose of the meeting is for everyone to share what is on their calendar during the upcoming week, to record any appointments that effect them directly, and to problem solve any calendering conflicts that emerge. I highly recommend that this meeting is a collaborative effort. 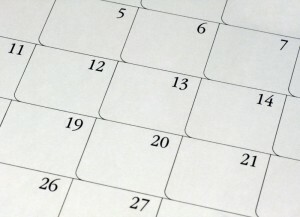 It is not a time for parents to be the authoritarian controlling the calendar. Rather it is a time for everyone — parents, teens, and younger kids — to share what is going on in the week, and make sure that anything that effects them is noted in their planner. Parent #1 might note that (s)he will work late on Tuesday, and so Parent #2 writes that down in his/her calendar. Pre-teen Sister notices that this means that she won’t get picked up on time from basketball practice, and so asks Older Brother if he can pick her up instead. Then Parent #2 reminds Older Brother that he has a dentist appointment on Wednesday at 10:30am; when he writes it down, he notices that he has a Spanish test that day. He makes a note to talk to his teacher about an alternate time to take the test. Pre-Teen sister reminds the family that she has a project due on Thursday, and will need a ride to the library on Monday night. Parent #1 offers to drive. Everyone writes everything down in their own calendar. Why is this a magic solution to family calendaring?! Helps kids and teens build a personal habit in the context of a family habit. After all, if the family can’t be organized enough to refer to the planner once a week, why should the teen be that organized on on his or her own? Requires that kids (and parents!) actually have a planner, refer to it, and write in it (another habit that teens aren’t likely to do on their own). Expects that family members come to the meeting already knowing what their week will look like. That means keeping up the calendar in between family meetings! Models a great technique teens can use later in life, in roommate situations or community living. Finally, a common complaint I hear from teens is that, “My parents didn’t tell me I had to go to Grandma’s house on Thursday night, so I couldn’t plan ahead!” or “My parents didn’t tell me I had that dentist appointment, so I couldn’t plan ahead with my teacher.” Of course, it’s highly possible that the parents in question DID tell the teen, but he or she didn’t HEAR them. However, it’s also possible that mom or dad totally forgot to tell the teen what’s coming up. The family makes both these possibilities a moot point by providing a time to get everyone on the same page. Have you experimented with family meetings for calendering? Does your family have another method that works for you? Please comment below and tell us your story! Warning to all students!! READ YOUR SYLLABUS!!! Warning: Is Your Tutor Teaching Bad Study Habits?